This photo was taken on May 23, 2014 at 11:00. The "Take it!" 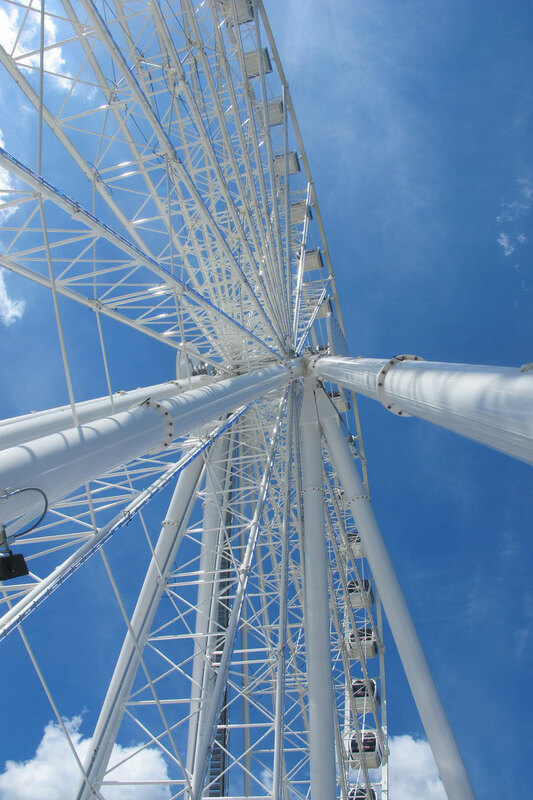 came from having a rare opportunity to stand next to one of the four steel uprights that provide the support base for this brand new Ferris wheel at this exciting new attraction located on the Potomac River very near Washington DC. The vantage point was afforded to me as I asked if I could speak to the site manager on the opening day of operation for this beautiful piece of machinery. I had just finished taking ride on this gentle breath taker and wanted to express my thanks to the team manager that had made it actually happen. I had through the course of time watched its full construction at the end of an existing pier at the marina already in place at the Harbor. I met a very outgoing fellow that was from the Amusement Ride Company that mfg the wheel and passed along my complements. He had been a project leader on other installations. so knew his business. He was quite friendly and seemed to appreciate my taking my time to express my thanks to him and his crew for putting in place a ride that will bring joy to many many for years to come. The After Take: All who have seen this photo like it immensely. There is something very attractive about the symmetry of the spokes in the wheel matched with the strong uprights set up to provide the axle upon which it spins. There will be more photos of this wonder put up on the site in the future. There is just too much available to try to put it all in one write up. PS: I used to have a power boat that I had docked at a marina across the river in Virginia that had no gas pumps. I would cross the river to gas up which was a new convenience once the marina opened. I thus had seen the setting for this entire development when it was just an inlet where we used to put down the anchor to swim and eat lunch. Progress can bring magnificence. Is this the same one from the guessing thing? Truly a remarkable piece of engineering. I think it is Jim. I remember the post on the eyellusion said it was at National Harbor. I bet the view at the top of that thing is just astounding.